Testimonials - What our clients have to say about Maui True North and the services we offer. "Maui True North made our retreat magic! Brett from Maui True North is seriously the best. "My long awaited trip to Hawaii led me & my 2 daughters to Maui, where we were referred to Maui True North for surf lessons. I didn't think I'd be able to surf, & my eldest daughter wasn't sure because of a skin condition which has limited her athleticism all her life. Brett showed her ways to pop up on the board without damaging her skin, & she bossed it! I actually surfed myself! And my youngest daughter nailed it! We all had so much fun & felt completely safe with Brett looking after us! We all got the total surfing in Hawaii experience..especially my daughters, who loved being driven to and from the beach in the back of his truck along with the surfboards!! After spending years of competitive windsurfing, ski racing, playing polo and countless injuries especially my neck, I suffer from vertigo and neck pain for years . 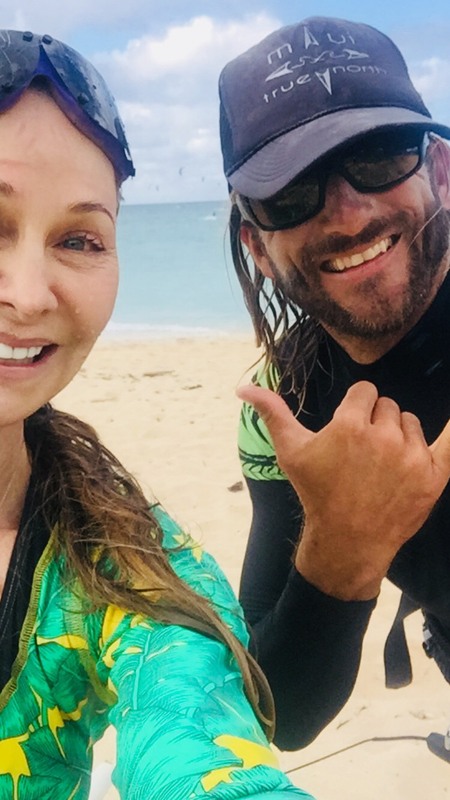 Pete Tahiti and I have been surfing as our family sport (I’m not the best at it but probably having the most fun) which I felt my neck was getting stronger! I felt I could finally give kiting a try . So for all those out there that wondered why doesn’t Lisa kite, now you know . They say don’t have your spouse(Pete Cabrinha)teach you a new sport , so I had the best instructor Brett @mauitruenorth !! Had so many laughs as you can hear on the video ! Thank you so much Brett ! LISA CABRINHA WITH BRETT SHEERIN FLYING THE KITES WITH HER NAME ON IT! PETE WAS PROUD!